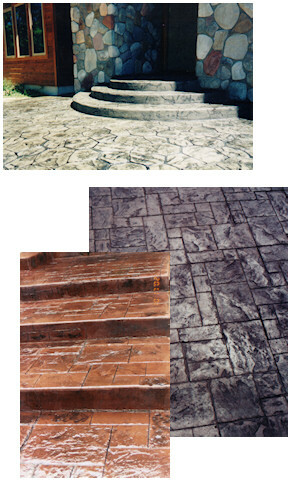 Working directly with me, our customers can custom design their decorative concrete. Our low-pressure approach allows customers to change the form layout as many times as necessary. Different integral colors and release agents allow for an infinite number of color combinations. We often work with landscape designers to incorporate decorative concrete into the overall landscape plan. Stamped concrete and exposed aggregate are both cost effective, durable, and low maintenance ways to add finishing touches to your home or business. Michigan has native stone ideal for exposed aggregate. Many designers use exposed aggregate for a rustic feel. Concrete sealers enhance colors and protect your investment. Pricing for decorative concrete is done on an individual basis. Stamped prices run from $6.00- $12.00 per sq ft. Exposed aggregate runs $5.00- $8.00 per sq ft. Integral color is included in these prices. A wide variety of integral color can be added to any job for approximately $.65 per sq ft. Concrete stain is easily applied to concrete of any age.